Continuing our exploration of Phish and their live show experiences, we’d like to share news about the band hosting a special show at Champlain Valley Exposition in Essex Junction, Vermont next Wednesday, September 14th. The show will be supporting those communities impacted by flooding caused by Hurricane Irene. General admission tickets will be $75. A special “Friend of WaterWheel” package will be available for $250. It will include preferred parking, a reserved box seat, a limited edition poster and access to a Vermont craft beer tent. A very limited number of tickets are available directly through Phish Tickets’ online ticketing system at http://phish.portals.musictoday.com. The ticket request period is currently underway and will end on Wednesday, September 7, at noon ET. Tickets will go on sale to the public on Saturday, September 10, at 10:00 AM ET. In order to ensure that a large allotment of tickets is available to local residents, the public onsale will be in-person and cash only. The box office location will be announced this Friday at Phish.com, by email update and on local radio stations. The WaterWheel Foundation was created by Phish in 1997 to oversee the band’s various charitable activities. Fans can donate to The WaterWheel Foundation by clicking here. You should specify that they would like their contribution to go to Vermont flood recovery efforts. Phish will also be having a live webcast of the Benefit show on LivePhish.com. Again, all proceeds going to The WaterWheel Foundation and The Vermont Community Foundation. The webcast is available for pre-order now for $19.99. And Phish is also offering a bundle option that will include an exclusive Green Mountain Logo t-shirt, to increase awareness and funds. 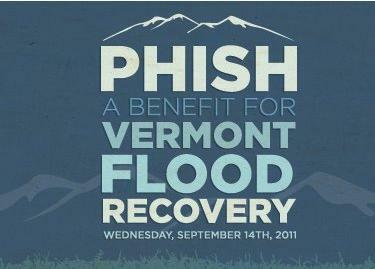 Ticket stubs for Benefit For Vermont Flood Recovery ticket includes a free MP3 download of the entire show (a fully mixed soundboard recording), redeemable at LivePhish.com after the show. For more information, visit http://bit.ly/iZxtcb. Do you have a Phish story to share? Have you seen them in 3D or followed them on concert road trip? This show is also a continuation of our grief, joy and community experiments and we’d like to hear how it or other benefit shows have impacted your life. We invite you to post your thoughts below and we’ll share your feedback during a future episode of Live Fix Radio.